This central coast community bills itself as “a great place to try new things,” and it’s an apt invitation for sure. Enjoy the arts, take a step back in time or venture into the outdoors to soak up nature, whether it’s the beach, the bay or the backwoods. When it’s time to refuel, you’ll find no shortage of fine restaurants. Start your day with crab cakes Benedict or a seafood omelet at the Wildflower Grill, where views take in the wetland home of beavers, herons, ducks and deer. Then head south to the historic neighborhood of Taft, aglass arts district. 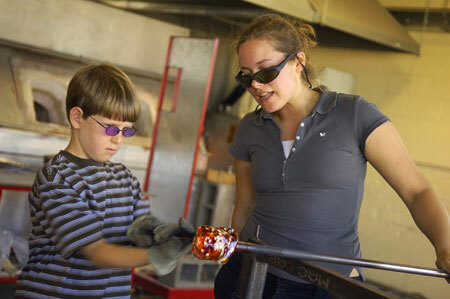 At the Jennifer Sears Glass Art Studio, visitors can watch a glass-blowing demonstration or blow their own work of art. Visit the Mor Art shop for fused glass art or browse the work of professional artists at the Volta Glass Gallery. The neighborhood also offers antique shops and galleries, like the Once In A Blue Moon Gallery and Tiki’s At 51st —a beach-inspired restaurant and gift shop. Taft is also a great place to pick up your Heritage Tour guide at the North Lincoln County Historical Museum. This self-guided tour leads visitors through the six neighborhoods of Cutler City, Taft, Nelscott, D Lake, Oceanlake and Wecoma, which were originally little towns of their own. Experience the outdoors with a kayak tour of the Siletz Bay National Wildlife Refuge. Guided by U.S. Fish and Wildlife rangers, the tours are free, but you must bring your own kayak or canoe. Call ahead to reserve your spot as the tours fill up fast. Finish the day with dinner at the popular Blackfish Café, known for its fresh local ingredients and beach favorites, such as the crispy fried Yaquina Bay oysters or the Pacific City dory-caught rockfish and chips.